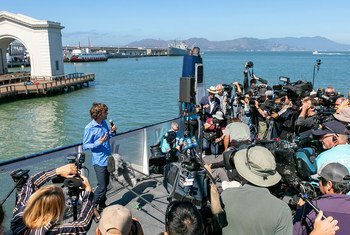 10 September 2018 – A trial run of an innovative system designed to clean up the world’s seas and oceans, founded by UN Environment Programme (UNEP) “Champion of the Earth” laureate Boyan Slat, has set off from San Francisco, in a bid to begin the removal of the so-called Great Pacific Garbage Patch. The Ocean Cleanup/Pierre Augier | The Ocean Cleanup vessel is aiming to clean up plastic pollution in the Pacific Ocean. It left San Francisco on its first voyage on 8 September 2019. This huge mass of marine debris, situated in the North Pacific Ocean, halfway between the Californian coast and Hawaii, is estimated by Slat’s Ocean Cleanup organization to measure 1.6 million square kilometres – 3 times the size of France – and contain 1.8 trillion pieces of plastic. That amounts to 250 pieces for every person on the planet. The Ocean Cleanup/Pierre Augier | The system is carried by the ocean’s currents and waves, passively catching plastic debris along the way. Champions of the Earthis the UN’s highest environmental honour, celebrating outstanding figures from the public and private sectors and from civil society whose actions have had a transformative positive impact on the environment. Every year, at least 8 million tonnes of plastic leaks into our oceans. Besides washing up on our beaches and shorelines, plastic marine debris accumulates in five garbage patches around the world: the Great Pacific Garbage Patch is the largest. (SOURCE: UN).